This is herbal feed supplement that maintains health and improves milk secretion in animals and cattles. It regulates bowel movements and increases food conversion. It also acts as a liver tonic and an anti-oxin that is available in powdered and liquid concentrates forms. INGREDIENTS:It includes exlipta alba, indian gineseng, phyllanthus niruri and piper nigrum. Supports liver during stress and strain. Helps increase body immunity to diseases. Helps improves blood hemoglobin content. Increases strength, stamina and energy. Keeps the animal healthy and increases livability. Non-hormonal herbal galactogogues help promote growth of mammary glands and helps in secreting large quantities of milk in the safe natural Herbal way. Increases feed conversion; Regulates bowel movements. Acts as anti-toxin; Supports liver during stress and strain; Restores normal liver functions. Helps increase body immunity to diseases; Purifies blood, Improves blood haemoglobin content; increases strength, stamina and energy; keeps the birds healthy. Thus increases LIVABILITY. Helps regulate hormonal secretion and their activities. Helps growth of mammary glands. 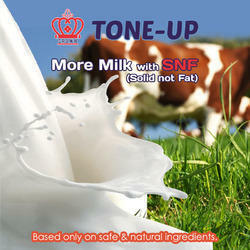 Helps to improve milk-secretion. Fine (mesh: 150-200) and dry powder. Recommended Dosage: 1kg-2kg / MT of feed. Presentation: 1kg, 5kg & 25kg poly pack. Looking for Animal Feed Supplement ?